Rivals score dramatic injury-time winner to defeat Albiceleste in friendly match in front of a sell-out crowd in Saudi Arabia. 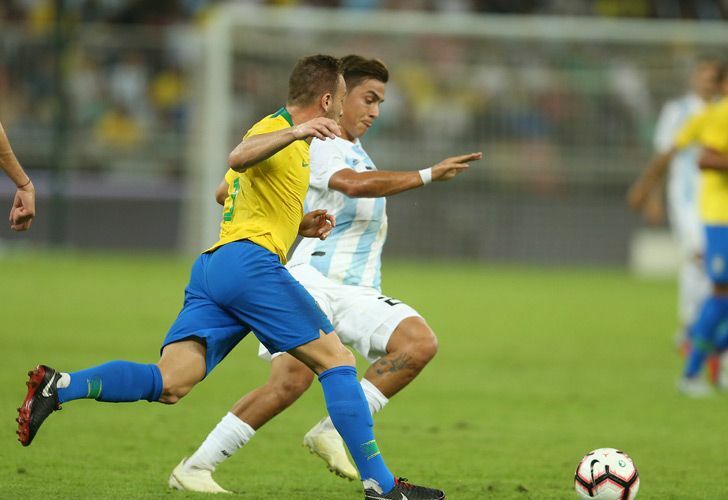 Brazil snatched a dramatic injury-time winner over Argentina with a header from Miranda in their friendly match in front of a sell-out crowd in Jeddah, Saudi Arabia. The Inter Milan player was left all alone to thump in the 93rd-minute header from Neymar's corner when the match between the fierce rivals seemed destined for a stalemate. The lapse spoiled an otherwise strong defensive performance from the Albiceleste, who contained Brazil for long periods in the clásico. Casemiro came close with a 25-meter free kick manufactured by Neymar that flew past Romero's left post. Then Nicolás Otamendi stuck out a boot to deflect a diverted shot from Richarlison in the last minute. The Albiceleste's best chance came during a period of pressure around the hour mark, when Paredes hit a swerving, dipping drive that had Brazil keeper Alisson beaten. Missing from Argentina's line-up were Manchester City's in-form forward Sergio Agüero, Paris Saint-Germain winger Ángel Di María and Lionel Messi. The captain has sat out Argentina's last three matches, all friendlies, since the country's disappointing last 16 elimination from the World Cup in Russia. He is believed to have asked for some time off from international duty ahead of next year's Copa América in Brazil. It was the 104th time the arch-rivals have faced each other in an official match, with Brazil marginally ahead on 41 wins to 38, with 26 draws.